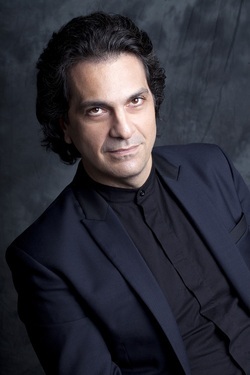 With his extensive repertoire of recitals and concertos, Tsabropoulos has taken the stage with Europe's several important orchestras including among others the Philharmonia Orchestra ,the Stockholme Philharmonic, the Czech Philharmonic, Budapest Chamber Orchestrate, Sofia Philharmonic and Italy Radio Orchestra. His repertoire varies from Bach to Beethoven, Chopin to Prokoviev.As a pianist he is highly effective in Russian music, particularly in Rachmaninoff.He has participated in festivals throughout Europe and has performed every season in the musical centers, presenting a wide repertoire in concerts, recitals and chamber music performance. He has made his first USA tour in October 2004 with a significant critical and popular success. Pick of his career is his performances with London Philharmonia and Czech Philharmonic Orchestra under the baton of Vladimir Ashkenazy in piano concertos of Beethoven and Rachmanninof. Tsabropoulos has also been involved in several television projects, such as the Akroasis series(2012)filmed in Athens for ERT1 . Vassilis Tsabropoulos is Honorary President of the Sergei Rachmaninov Greek Sociaty. He is also the Founder and the Music Director and Principal Conductor of the Metropolitan Symphony Orchestra of Athens and he is Artistic Director of the Sacred Music Festival of the Radio Station of the Church of Greece.